Written by Jordan Donald on January 30, 2019. You know deep down that you should be getting to grips with budgeting, saving regularly and investing for your retirement but you’re not. And you’re not alone. It is difficult to think about the future when we live in an insanely fast modern world where we’re frantically pedalling to keep afloat in the here and now. We are so caught up in today’s problems that we don’t have time to think about tomorrow. And I get it. When you’re struggling to get through today, long term thinking inevitably takes a back seat. But is that the only reason we aren’t saving? I know from personal experience that it can’t be. I come across many high-earning expats in Shanghai who are more than comfortable financially living the high life with money and time to spare, and yet they still aren’t doing anything sensible with their disposable income to secure their future finances. It got me thinking that there must be a psychological explanation for why we don’t save. So I was interested to come across an article about new research which suggests that our perception of financial planning as cold, mechanical and lacking emotion has a lot to do with why we put off tackling even the most basic financial decisions. We’ve all seen the films like The Wolf of Wall Street which stereotype money men as cold, calculating, ruthless and lacking in remorse. Who wants to be like them? Unsurprisingly, this perception spills over into real life and people who consider themselves to be emotionally led tend to feel that they don’t have that cold and analytical side to their personality, ergo finances are simply not for them. Maybe that’s because we are constantly hearing that we should keep our emotions out of financial matters and rule with our heads rather than our hearts. But is it time to question that? Adding a little bit more emotion into the financial planning process can really help change people’s attitudes to tackling financial decision-making. People take their financial planning seriously when they picture their dream retirement – whether it’s travelling the world or spending time with the grandkids. It’s a more positive way of looking at it than pages and pages of accounts that scream “No savings”. At the end of the day, life’s going to be a lot tougher than it is now when you are knocking on 70’s door, unable to work and with no retirement savings to get you through the next decade(s). This can be avoided – IF you stop procrastinating and start taking your financial planning seriously now. 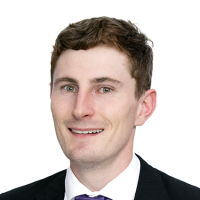 But just how do you carve out the time to prioritise financial planning? There are lots of different ways but I like to use the process from Stephen Covey’s excellent book, The 7 Habits of Highly Successful People. If you haven’t already read it, I highly recommend that you do. It was published 30 years ago in 1989 but its principles still hold true three decades on, in particular the time management matrix, which divides tasks up into four quadrants. Covey’s theory is that most of us spend time doing things in quadrants I and III because they are urgent and require immediate attention. 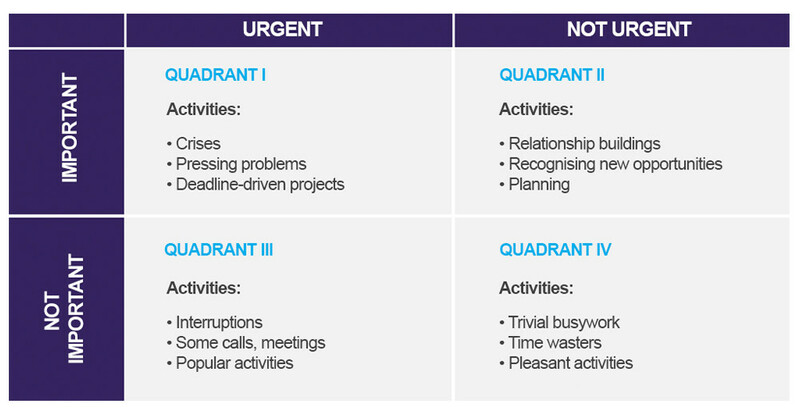 However, quadrant II is the one we should be spending most time on. It is here that you will find tasks that are not urgent but are vitally important - like strategic planning, relationship building, education, exercise and yes, financial planning. They are the fundamentals of life that we know we need to do but shove down to the bottom of our lists because they don’t feel urgent. Our 24 precious hours each day get taken up doing the activities on the left but we need to shift the balance to spend the majority of our time doing those on the right. While you are allowed a little time for quadrant IV to catch up on social media and Netflix, your challenge is to focus on quadrant II – thinking ahead, planning strategically and sorting things out in a calm and clear-headed way before they turn into crises, jump into quadrant I and become huge, time-consuming problems. You can relate this to many aspects of life from marriage to exercise, but I’m urging you to specifically use it to prioritise your finances. You might be able to kick the retirement can down the road for a while but eventually it will become an issue - the longer you leave it, the more likely it is to dominate your life. Doing something about it now can ensure that 70 year-old you doesn’t have to decide between heating or eating! Of course, it’s always easier to tackle tough things with someone on your side, which is why you might want to consider a professional financial adviser. A good one really will save you time and money and ensure that you don’t make foolish and costly decisions. If you’d like a professional in your corner, why not get in touch? You can email me for a free, no obligation consultation at jordan.donald@infinitysolutions.com. Posted on January 30, 2019 in Financial Planning. By Trevor Keidan on May 08, 2018.